Almost anyone who has dealt with Bishop Edward Burns to any great extent will comment before all else on his upbeat personality and cheerful manner of dealing with others. Indeed, among his fellow Bishops and those who are concerned with the affairs of the Catholic Church, he is known for the “sunshine” he brings to bear even in the most difficult situations. 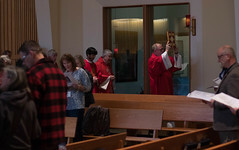 As one who has had the opportunity to minister with Bishop Burns over the last eight years, I can attest that this positive approach is neither superficial nor artificial, but rather is deeply rooted in his relationship with God, the joy he has in his vocation as a Catholic priest, and his profound gratitude to those who help him to live out that vocation. As a close assistant to Bishop Burns, I have been able to observe him in the good times and in some really, really bad situations. When things are going smoothly for Bishop Burns, just about everyone around him knows it. Indeed, he has repeatedly told us that he has had a “blast” serving as Bishop of Juneau. What has struck me, however, is that the upbeat optimism that he so effusively expresses when things are going well does not disappear in the tough times. Instead, it is transformed into a hopeful confidence that, in some way, the Lord will bring good out of very unpromising events, a confidence that has regularly proven to have been justified. I have come to see that this, in turn, has a solid foundation in the Bishop’s firm commitment to and practice of prayer every single day, the time and effort that he spends, as he describes it, “on my knees.” While many of us lamented the loss of a very nice guest room in the Bishop’s house that we had become accustomed to using on visits to Juneau, I can see in retrospect how important the transformation of that room into a chapel was for the Bishop’s nourishment of his relationship with the Lord, the relationship of love that lay at the basis of his service to God’s People. Bishop Burns placed special emphasis on his relationship with the priests of the Diocese. One of the first practices he introduced after his arrival was a conference call taking place every Monday morning during which the Bishop and priests would exchange news before praying the Liturgy of the Hours. He always referred to us as his “Brothers,” and contributed to the development of a sense of brotherhood among us. 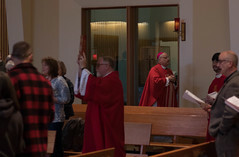 In fact, his first pastoral letter had as its subject ordained priesthood in the Diocese of Juneau, and we all played a part in writing and signing it. As time went on, I and others came to see that all of this manifested the profound joy that Bishop Burns has in his vocation as a Catholic priest. He loves doing the things we do as priests, especially the celebration of the Eucharist and other Sacraments, and this love comes through for those who share with him in these celebrations. He finds great joy and satisfaction recalling the events of his priestly ministry, particularly those that have a humorous element. He makes special efforts to share that ministry with those in our Diocese who lack the regular opportunity to experience it, such as the inmates of Lemon Creek prison on Christmas, or the seasonal Catholic fish processing workers in remote Excursion Inlet. Finally, Bishop Burns is a person who is very grateful for the people God has entrusted to his pastoral care, particularly those who actively collaborate with him and share their own gifts with the community. How many of us have been on the receiving end of his generous expressions of thanks for some effort successfully completed or job well done? “Thank you! Thank you! You are such a gift to the Diocese of Juneau!” are words that so many have heard after what we regarded as simply doing our jobs. Bishop Burns truly rejoices in the gifts and talents that God has granted his People, and in their willingness to use them for God’s greater glory. As Bishop Burns leaves us to shepherd the huge Diocese of Dallas, our sadness at losing him as our Bishop should be mixed with joy that so many people will now have their own experience of his wisdom and strength as a successor of the Apostles. Let us pray for him and for them, that the years ahead will be blessed for them, as those just past have been for us, by the leadership of the joyful shepherd and brother through whom God has worked in so many ways for the benefit of his People.